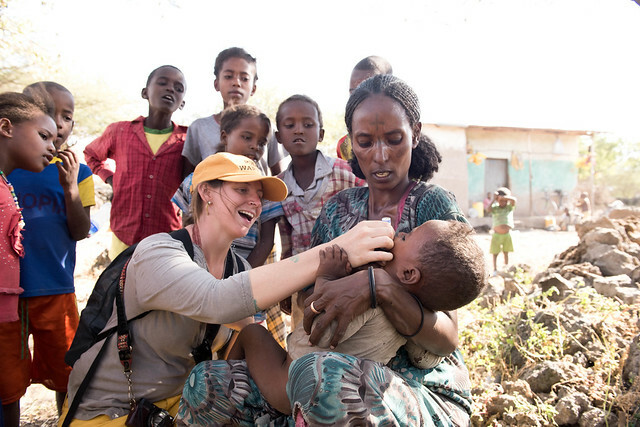 36 Rotarians from Ethiopia, Canada and the United States visited East Shewa zone in the Oromia region of Ethiopia to deliver polio vaccinations to more than 600 children under the age of five. 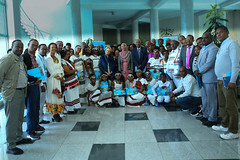 The visit marked the launch of the first round of polio National Immunisation Days in the country and the group also visited the country office of UNICEF Ethiopia, which is a partner in the global polio eradication initiative. The visit coincided with an intensified immunisation campaign in Ethiopia, in response to the polio outbreak which began in August 2013, triggered by the Horn of Africa outbreak in Somalia and Kenya. As of November 2014, 10 cases of Wild Poliovirus Type 1 (WPV1) had been confirmed in the Somali region of Ethiopia. At the UNICEF Ethiopia offices, members of the Rotary Polio Advocacy Group were shown a video and presentation on polio eradication efforts in the country, followed by a discussion. Patrizia DiGiovanni, Acting Representative to UNICEF Ethiopia, welcomed the Rotarians and thanked them for their continued support in efforts to eradicate polio, which included a recent grant. The grant is part of a larger announcement by Rotary International marking World Polio Day of a pledge of $44.7 million to fight polio in Africa, Asia and the Middle East. 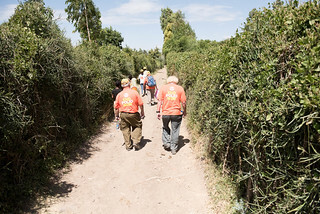 To date, Rotary has donated more than $1.3 billion to global eradication efforts, allowing the mobilisation of resources at the grass-roots level through volunteer leaders. 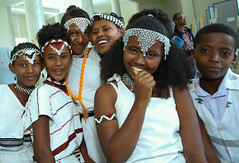 During their visit to the Oromia region, the Rotarians attended a colourful ceremony at a primary school, alongside Dr Kebede Worku, State Minister at the Federal Ministry of Health and Dr Taye Tolera, Special Adviser to the State Minister of Health. They were joined by the Federal Ministry of Health Expanded Programme on Immunisation (EPI) team, staff from the East Shewa Zone Health Office, UNICEF, WHO and other partners. The group visited several kebeles within East Shewa Zone to visit people’s homes and carry out vaccinations, accompanied by kebele Health Extension Workers and Health Workers. The Lume district health office and Shara Didandiba Health Post organised a kebele launching ceremony to mark the Rotarians’ visit. The Rotarians handed out t-shirts and caps to children and parents at the event. The visiting Rotarians have a range of backgrounds, but share a common interest in supporting polio immunsation, child health and development programmes in Ethiopia. 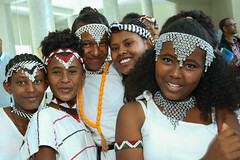 Some members of the group have visited Ethiopia several times. The visit was intended to inform and promote polio advocacy work in Canada and the US through advocacy and fundraising, as well as engagement with US Congressional leaders. Rotary International is spearheading the Global Polio Eradication Initiative, alongside the World Health Organisation, Bill & Melinda Gates Foundation, US Centers for Disease Control & Prevention and UNICEF. It has been at the forefront of the global fight against polio for the last three decades. My wife and I leave IAD, Virginia, for Addis Ababa on April 5, 2015. I have collected five 50 lb bags of ladies clothing, girls, babies, and boys clothing and about 40 pairs of shoes (tennis, walking, sandels, etc).